I am registered blind, but I am getting fed up of the robotic announcements on stations reminding me that train doors close up to 40 seconds before departure and to keep an eye on (!) luggage and personal belongings. They could make it better. In some bus stations they have boxes fitted to the stands that announce the times and destinations when you press the button, You could fit these to platforms say every 2 metres. On the trains if you are sat near the Priority seats or near doors, the boxes could tell you the next station, and the train’s destination. You would still need the announcements at times of disruption, as well as an audible tone to let me know that a new announcement is available. So, in essence, you can get rid of all announcements, and replace them with these “on demand” boxes. A much simpler, quieter and elegant solution! 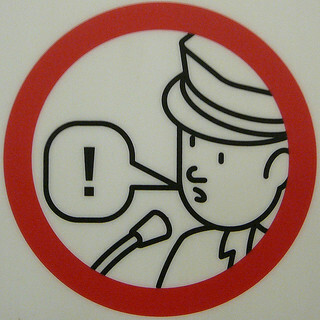 An good example of excessive announcements is Virgin Trains with “Please do not leave items unattended on the railway and beware of any suspicious items or behaviour. Report these to a member of staff or the security services” announced twice for every station stop, so up to 25 times between London and Glasgow. Often referred to as “Digital Doris” or “Mary Poppins” (nanny knows best) few have the neatness of the succinct “Mind the Gap” iconic railway announcement. Some blind users benefit from ‘beacons’ on bus stops which transmit information to any mobile receivers nearby, and this might also be available for those with poor hearing. Sit in the coach and click the hearing aid to a setting which than captures any announcement made – even it it isn’t broadcast to the train. One option might be to piggy back this on the wifi systems already operating on the train, or for train locations, look at what the independent guys are doing with Network Rail , TfL and ATOC free-access data, you could identify the calling points and get buzzed when your train is reported to be at the sequence preceding the one you want to get off at. What exactly am I supposed to do with this information? So the irritating, nagging, wittering, sub-Sloaney programmed female voice constantly tells us every two minutes or so…..
Can you BELIEVE the utter inanity of the wording of this announcement? Not to mention, the sheer repetitiveness of it – whereby some of the words are repeated (in the case of ‘luggage’, an astonishing FOUR TIMES). Who the bloody hell came up with this one, stating the bleeding obvious? It’s exactly the same as saying ‘toilet facilities are located on platform X or Y, to enable you to use the toilet’. For goodness sake! And all those other ones from Nagging Sloaney Cyber -Hectorer that sternly proclaim: ‘THIS IS A SAFETY ANNOUNCEMENT’ (oh, you don’t SAY!!!!!!) , of which there are now three or four different variations (wet weather, cycling/skateboarding, stairs and escalators), are just as totally pointless and irritating. Apologies for the rather dodgy syntax of my post above…. just in case others point out the irony of, on the one hand, my criticism of the wording adopted in the aforementioned announcement[s] whilst on the other, my own syntax not being exactly that great either – it’s late, and I have had a hard tiring day (being bludgeoned into submission with, yup, you guessed, endless rail announcements during my commute….) so my brain has probably half turned to mush by now…..